Sarah Fantom Photography: Yes the sun will shine again! a: is it groundhog day? b: has mother nature finally decided to treat us as too many people treat her? c: will the sun ever stay out for more than 10 minutes ever, ever again!! While the weather certainly helps most of us motivate on a daily basis. . Maybe it's time we each start waking up and realizing what it is we have to be happy for and acknowledging one thing a day, one day at a time. In doing so you will realize that nobody else is responsible for your own happiness, just YOU. It is actually a really great feeling and you will come to know you have a million things to be grateful & happy for. Yes, the sun will come out again and summer will be here. I will be busy photographing your families and children at various beaches. We will all be able to enjoy the usual full day on the beach, cookouts, late afternoons with friends watching the sun go down and the kids play. 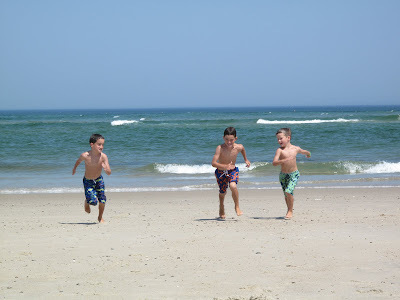 I can feel it just thinking of my boys running around laughing, splashing, boogie boarding, and jumping waves with friends they may have just met on the beach that day! Hopefully this picture brings a smile to your day and you too can think of what memories this summer will hold for you. I used this picture 2 years ago as part of my Christmas Card, it was my favorite holiday creation thus far. My boys have grown so much since this but they for sure still race for anything and everything!